* some score settling with McCain aides she believes ill-served her (names will be named). * a hearty bashing of the national media. * an account of how her upbringing shaped her maverick sensibilities. * a testimonial to the importance of faith in her life. 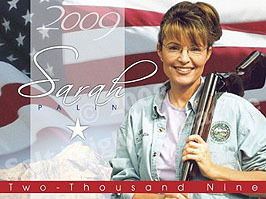 * a warm and personal tone, written in Palin’s own voice, despite the involvement of a collaborator. * Don’t look for hefty policy prescriptions. * Once source who has seen “Going Rogue” says it does not include an index. That would give Palin a subtle revenge on the party’s Washington establishment, whose members tend to flip to the back pages and scan for their own names. If they want to know what Sarah Palin has to say about them, they will have to buy the book — and read the whole thing. Yep, that’s a real shocker. Score settling! Media bashing! Maverickiness! Faith! Light on policy! Jesus. As for the index thing, I hope someone is just pulling Halperin’s leg. It’s true that Beltway types like to look in book indexes for their names, but not including one won’t slow down that game by more than a few minutes. Hell, if it doesn’t have its own index, some obsessive nerd will scan and OCR the whole thing and create a web index before it’s even hit the shelves. Still, it does reek of that trademark Palin combination of spitefulness and teenage tribalism, doesn’t it? Plus a gratuitous dose of anti-intellectualism, since only scholar type folks use indexes. So maybe it’s true.